4 oz cranberry-orange yogurt and 4 oz orange creme yogurt. Why? Because the cranberry orange yogurt was so delicious that I finished half the cup before I knew it! 1/2 cup walnuts, cos I am crazy about them and as of these holidays, slightly allergic to them, too! The sides of my tongue hurt and I feel the need to bite down on that area and hurt it even more. According to the best neurologist in the NY-NJ area, it's a mild allergic reaction. I skipped the dessicated coconut in the bread but sprinkled some unsweetened coconut powder on top in deference to taste buds that are only 8 years young. Verdict: A big huge YUM! Easy to make. Next time, I will make it with just one egg-white. More pictures of the Quick Orange Walnut Bread to drool over. First let me wish you a very Happy New Year. May 2007 bring you a lot of joy and happiness. I look forward to getting to know you a little better. Second, the cake is to drool over. I actually came through the Flickr stream LOL! Saw all the pics there and had to check out the details here! Brilliant! Great recipe for a start!Enjoy Manisha! The walnut part had me in splits - because I knew "exactly" what you meant! OK! So I am beat. Really really beat. We were hit by yet another winter storm and so far have picked up about 10-11 inches of snow. It's the third one in three weeks. The local news channels are calling it the third Freaky Friday in a row. The school district was closed today due to inclement weather. I spent an hour clearing the driveway with the help of my neighbor's 11 year old son. Then we went sledding because there was no way of getting out of that. I came back to find two more inches on my driveway. I shovelled some more and that's it - you hear me, Weather Gods? I'm done! It needs to STOP! It's fun alright but if you are like me and when God was handing out height, you heard flight and you missed yours, then shovelling snow and tossing it onto piles as high as you is just not fun! There is no place to put this snow! We will have received 4ft of snow in the last 3 weeks! People are selling it on eBay. Don't believe me? Go to eBay and search for Colorado snow. Seriously! Kaam dhanda nahin hain! 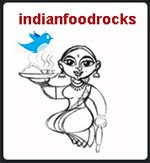 Meeta, congrats on Daily Tiffin's nomination for Best Food Blog in the Family/Kids Category! Yay! Folks, if you haven't voted for it yet, go vote now! I'm thrilled you liked the pictures of the bread. That means a whole bunch to me! I take a lot of inspiration from the effort you put into your pictures, so thank you! Asha, same to you! And, yes, it's a great recipe to kick off the New year with! Easy and delicious. We closed the door on 2006 with Archana's Kerala fruitcake. That's the next one in my inspired series! Ashwini, I am so glad you liked the pictures! The taste is incredible, too! I didn't want it to flop if I used just one egg-white, so I used two. Now I think I have the confidence to try it with just one. The allergic reaction is slightly different from the itchy tongue feeling. This was pain! But it doesn't happen every time. Like, earlier today, I went out and shovelled heaps of snow, came back in, had a hot cup of tea with orange bread slathered with spread. No 'fat' or painful tongue! If only I were that smart, I would make altitude adjustments by instinct! Archana put me onto this FAQ at Ochef about high altitude baking. When we moved here, I just didn't get it for a while. Things took forever to cook but they cooked in the same amount of time in the pressure cooker as they did at sea-level (Illinois). Tea went cold as soon as it was poured out. if you heated it again, it still cooled down faster than you could drink it! I understood exactly what my father complained about when we first moved to Nairobi. Which, like Louisville, is at 5500ft! Manisha, don't worry, the snow storm will stop. I love snow, but my husband HATES them. So you can send some here if your can :D.
The Orange walnut bread looks so goood. I saw the pictures, they have come out great. I have to cook it sometime. I thought breads are always done using yeast :)), and my last attempt with a yeast package was a huge disaster. My pizza base turned into a wooden piece :). Too much of a good thing..? But the bread with that pretty brown crust, looks great! First time here. Enjoyed reading your blog .I remember well the post you had written on plagiarism-very intense,passionate and Iam sure it must have warded off a lot of copy cats . I like your style of writing and admire the fact that u have time to write and update a blog regularly inspite of being a busy mom. Now to the snow...I can say I have been in your shoes..Seattle has been hit hard with snow and power cuts and a month of continuos rain .Miserable is all I can think of and fit enough to drive sane and sunny tempered people to depression(yours truly) ...Having said that 4 feet of snow in 3 weeks in really pushing it. Would you mind sharing your slow cooker version of shahi haleem with me? I adore this dish, and I think using a slow cooker to prepare it is a wonderful idea, given how time consuming it is to whip it up the old-fashioned way. You can email me at sanangel@ucla.edu. Thanks so much! Salaam! Hey dear friend! Thats what fellow food bloggers are for- inspirations - i wanted to try her orange bread too... now im trawling the blogs for a nice dinner menu -some friends visiting. i have EXACTLY the same feeling with walnuts- gosh i didn't know that was an allergy :( but that never prevented me from munching on them. Nice post Manisha, you tried a wonderful recipe and it came out well and that is visible in the picture as well. Shilpa, no such luck - another one headed our way this Thursday-Friday. It will be the 4th in 4 weeks. We had ground blizzards yesterday! You know I've always wondered why some are breads and some are cakes. Like Banana-nut bread, for example. The ones with yeast are bread, though. Hmm! I think this is a question for my friend Lee. Lee, if you're reading this, what makes something a cake and another a bread? Shilpa, the yeast may have been old. Maybe we should try it again as a group project of sorts?! Anita, definitely too much of a good thing. I don't mind shovelling when the piles are low and when the sun melts it all away. Right now, this feels like Wisconsin or Michigan weather! Except for the sun, of course! Sra, you're the third person to tag me for that meme. I will try to do it this weekend, ok?! Coffee, come and help yourself to it! Truckloads, planefuls, whatever! Yesterday's ground blizzard was a scene from Eight Below. Kids huddled like small dark figures at the bus stop and snow swirling all around them. Everyone had their face down to stop the snow from hurting them. Brrrr! It's all ice now. Today we were standing on 2 ft of ice. Jump on it and there's no dent or imprint. Definitely ice. And slippery, too. Meenal, welcome to IFR! I think we all need to do our little bit towards spreading awareness about copyrights. Otherwise, just because it is available "free" on the Internet, it gets taken for granted and copied. I hear ya about Seattle! The arctic chill is going to hit you first before it makes its way to us! Stay warm! Make lots of adrak chai and have it with onion bhajjia. I did that after the first storm. It was bliss. Take care and Happy New Year to you, too! RP, more snow and even more this week. Come get it! Try the bread, it's easy and very yummy! Jarrod San Angel, welcome to IFR! I follow this recipe for shahi haleem. It makes a ton of haleem! I have to make it in 2 slow cookers: my 5 quart as well as a small slow cooker. It works well for me because I go easy on the spice in the smaller crockpot for Medha. I share this with a couple of my neighbors and I freeze the rest. I will post my method soon! My sister has a simpler recipe from her Pakistani friend that I want to try out, too. And, I am waiting for Nabeela to come back and post her recipe for authentic Hyderabadi haleem! definite no-no for her. Her throat starts "closing up". Well, as long as mine stays open, I'm putting walnuts into it! I love them! As I do pine nuts! first time for me here..
orange bread is good..will try soon.. Dropped by to see how you were doing? Hmmm, bread vs cake. Every language has its ambiguities, and American English certainly has plenty of them. Here is how I see it. With a few exceptions like tortillas and matzo, both breads and cakes have some sort of leavening, yeast, baking powder, baking soda, eggs, or fermented flour mixtures (sourdough). A cake that is leavened with eggs and/or baking powder will be sweet and have air beaten into it. 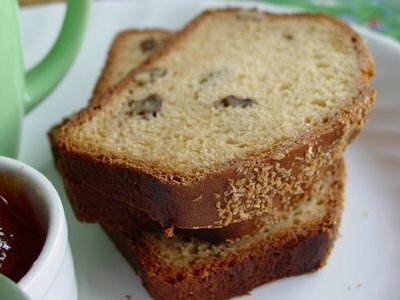 A quick bread which can also be sweet and have baking powder just has its ingredients quickly blended together; little bits of unblended flour are OK. In fact, over mixing a quick bread will make it tough. Yeast dough can be made into bread or a cake. A yeast cake usually has more sugar or honey than bread, more liquid than most breads and may be beaten rather than kneaded. And what I might call cake, someone else might call bread. And of course there are savory quick breads too, like a beer and cheese quick bread, but the majority of quick breads are sweet. Confusing? Of course it is! And others may disagree with me. The bottom line here is that the orange walnut quick bread you made looks wonderful and I want to try it. In fact I wanted to make it a few days ago using some plain yogurt and orange zest and a little OJ concentrate. But I decided to use my yogurt in a Chicken Korma recipe that I found on the net, which was delicious. Now I have to buy more yogurt, and other things for our very cold weekend ahead. I’ll let you know how the bread turns out for me. Keep warm; I can't believe all this snow we are having. Manisha - happy new year. I keep reading about the snow in colarado. Hope you and your family are doing OK. I've got some yogurt sitting in my fridge right now. I'll have to try your recipe. Thank you Ashwini and Manisha. I made this today with a few different tweaks and we loved it. My changes were also due to what I had on hand. The weather is still to cold to go out for just one or two things. So I used plain lowfat yogurt and added two T of OJ concentrate along with the zest. I also added about a teaspoon of grated ginger - what the heck, the microplane was already used for the zest so might as well use it a little more before washing it. I also used all white flour; I had white whole wheat flour in my garage fridge but it was too cold to want to go out there and get it. I used unsweetened flaked coconut - passed on the nuts because they were in the garage fridge too. This made a great day off breakfast and I just had another piece with some tea. Anon, welcome! Try it! You'll love it! Ashwini and Anon, we're doing fine! We're now looking at a possible 5th freaky Friday! Lee, thanks so much for taking the time to post that information on cake vs bread! I really appreciate it! And, you are too funny! But I don't blame you for not wanting to step out. Garages are cold places! Although the weather, in general, was warm compared to the weekend! I drove into Boulder today and the sun felt really good! Ginger sounds like a very interesting tweak! I must try it with ginger the next time! What I loved most about this recipe is that it's very tweakable! I'm so glad you enjoyed it! I'm sure Ashwini will appreciate it, too! Megan, welcome! Please do try it out and if you had any tweaks of your own, please share them with us! Mandira, I got an alert for a comment from you on this post but for some reason it does not show here. I just wanted to say thank you for thinking of us in this weather. We're doing fine! Here's an update I posted yesterday. Argh! What a time for your husband to pick to go to India! You are one brave woman to handle all that snow by yourself. Hang in there. I'm trying to see if staring at the picture of the orange bread from time to time will make the craving go away. Somehow I think I'm going to lose. Terri, not much choice with the timing. It was a year since his father passed away and he had to make the trip for the shraddha. The Orange Bread worked to cheer us up while he was gone. And it was a real treat to come indoors, after horus of shoveling, and have a hot cup of tea with this orange bread. I made this again on Sunday,Manisha. This time I did not find the orange-crème yogurt. Instead, I mixed orange juice in homemade yogurt with extra zest. I have forgotten how my previous attempt tasted, so I couldn’t tell the difference in taste. I enjoyed this batch a lot too! Shilpa, you have been busy, haven't you! Adding orange juice with zest sounds like a great idea. I need to make this again. I think I will do exactly what you did!